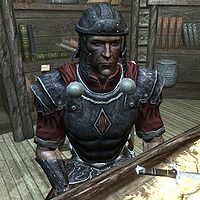 Salvarus is an Imperial from Cyrodiil. He is a Lieutenant onboard the Emperor's personal ship The Katariah. He carries a Katariah Master Key that will be useful during the related quest. As well as the aforementioned key, he carries a torch, a steel dagger, some food and drink, and a small amount of gold. Salvarus wields an Imperial sword and is armored in a full set of Penitus Oculatus gear. This page was last modified on 21 March 2014, at 18:18.